The Govan Reminiscence Group is a local social history group that has been running in Govan for 30 years. The group meets every Tuesday at 2.00pm in Elderpark Workspace in Govan where we discuss different aspects of Govan's social history and issues relating to the Govan community today. We work with many community and heritage groups in Govan and further, recently we have been making short social history films with Britain from Above and recording oral histories with Govan's Hidden Histories team and Ice Cream Architecture, quotes from these recordings have featured in both projects publications . We also work closely with Fairfield Heritage Centre where many of our members are volunteers. 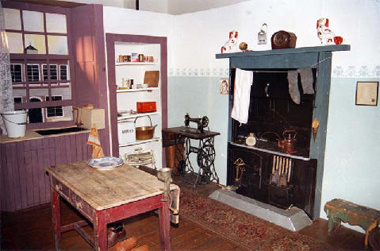 We are always happy to welcome new members and visitors to discuss Govan's rich social history, if you would like to arrange a visit or find out more information you can use the Contact Us link above. 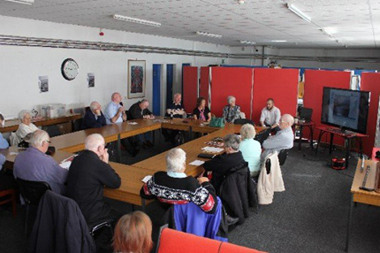 The Govan Reminiscence Group started by collecting stories of the life and upbringing of elderly Govan folk. We did this by recording these stories on audio tape. This proved interesting and we began to collect some artefacts. On contacting the local Govan library, the Librarian Cathie Knocker offered us a shelf to make a small display. By the time this had been arranged we had amassed many items. Cathie then joined our group and attended our meetings as we met on her day off, she also offered her advice which we accepted gladly. We were then offered a room in the Elder Park Library to put on a display of our collection. This included photos, maps, and some artefacts which proved very popular especially our collection of old school photos, we overheard our visitors exclaim "That was my teacher" or I know who that is. That was our start and we have had various exhibits and projects since then including building a Single End 14ft x 14ft and furnished with set-in bed, Gas light and bunker, this was on display in various venues in Glasgow and as it was only made of 1/2" inch cardboard. Sadly this became a bit ragged, so we photographed our model and dismantled it. We then decided this was all good fun, most of us were retired shipyard workers and friends. We then formed the "O" things O' Govan" and started various projects, collecting stories of our upbringing. From then on we put on a Govan Pageant performed by school children, organised a swimming Gala in Harhill Street Baths, some years ago. The Govan Baths with Steamy no longer exist. We built and displayed various Floats for the Govan Fair. We also erected a full size loom for display in the Govan Library. Complete with songs, from Ann Lome Gillis and Jimmy McGregor. The loom itself was on loan from the Paisley Museum. We have written a few books, 'Govan Postcard Book', 'All our Yesteryears' and put in place the Govan Trail with assistance from the Glasgow Council South West Area Committee. 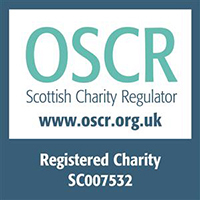 We then became a bit sophisticated and changed our name to The Govan Reminiscence Group. We have been in existence for over 20 years, lost some of our original members but new recruits have joined. We continue with new projects, and visit interesting places in Scotland. It's still good interesting fun. 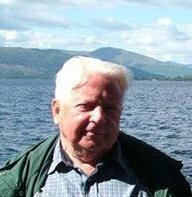 The section above headed 'The beginning of the Govan Reminiscence Group' was written by the group's founder Tommy Stewart who was chairperson and driving force of the group until his death in 2009.